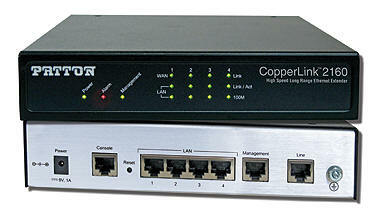 You’ll want to consider the Patton 2162 Ethernet Extenders as the best bandwidth solution. With these units you can use 1, 2, or 4 pair twisted pair to achieve maximum transmission speeds of 22.8 Mbps at a distance of 1.6 miles (2.6km). And they will work to distances exceeding 5 miles. These units come in a 2-Pack Kit with everything you need to extend your network the distance. The manufacturer part number is 2162/EUI-2PK . For more information click on the link above, or call us at 610-399-3911.